Have you ever wondered where bloggers get their inspiration? How do we figure out exactly what to make daily or weekly? Some from where they live, some from their friends, some from travels to exotic places. I have a new place to waste a bit of time. A place even better than cooking magazines. Pinterest lets me create boards of interesting things, organizing them as I go into pinboards of topics. Spending just a bit of time each night looking at all the fun things folks have found is a guilty pleasure. So when I spot something as cute as these little cookies, from Kerry over at BakerGirl, I just have to put them in the “convert to gluten-free” category. But try as I might, I couldn’t find gluten free chocolate covered pretzels nor did I want to create a peanut butter cookie due to other allergy concerns. So I flipped the idea around creating these tender crisp chocolate cookies with Glutinoantlers. Using the cookie mix I made up last year made the creation of these chocolate gluten-free cookies truly easy. I like the eyes with more personality, don’t you? Those were simply a substitution of white chocolate chips pushed tip first into the dough then a tiny mini chip is placed on top. You can vary the expressions quite a bit with placement. And those red, red noses? Watch out with these, many of the red hots I picked up had modified food starch in them. These are tiny cinnamon red hots from Betty Crocker in the general baking aisle. And the chocolate cookie? Simple just followed Ruhlman’s ratio for 3 parts flour:2 parts sugar:one part fat as a guide. I counted the cocoa as a flour. Summary: When I saw the inspiration cookies, I just had to convert them to gluten free for the holiday Bellingham Gluten Intolerance Group cookie exchange. 113 grams (1/2 cup) unsalted organic butter or Spectrum organic buttery shortening to keep them dairy free as well. Add the cookie mix and cocoa. Form the dough into 2 tablespoon sized balls. Pinch the ball to form a wedge shaped cookie. Push two pretzels into the flat end of the cookie. Push the tips of two white chips into the cookie below the antlers. Top each white chip with a mini chip for the pupils. Push a mini red M&M or red hot in for the nose. if you want to make mice instead, Pinch the cookie to a sharp point, just put in the loops for ears and sub in a tiny chocolate chip for the nose. Well, I couldn’t find chocolate covered pretzels till I clicked on over to Amazon. Figures, but I wouldn’t want 12 bags anyway. 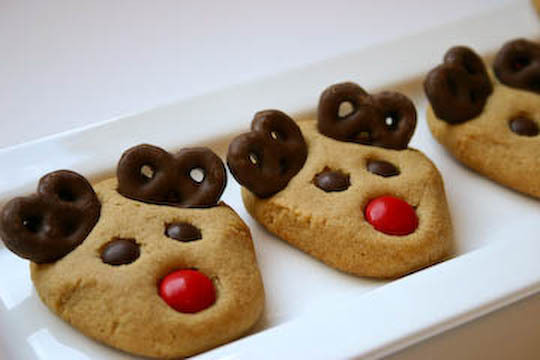 If Chocolate Reindeers aren’t the cookie of your dreams this holiday, consider one of these recipes from my fellow gluten free ratio rally colleagues.